Firaxis is branching out into a spookier flavor of strategy. Every zombie uprising, vampire attack, and Frankenstein's monster leads to a bunch of hoopla about the creatures, but the crazed mastermind behind this villainy deserves some time in the spotlight too. After all, somebody has to keep the evil lair running at peak efficiency! Firaxis Games, the developer behind the Civilization series and the revived XCOM: Enemy Unknown, invite you to step into the shoes of one of these wicked puppetmasters in their upcoming free-to-play iOS title Haunted Hollow. While Firaxis has plenty of experience creating finely-crafted strategy games, Haunted Hollow will be their first title developed exclusively for mobile devices. Players will take charge of a haunted manor of some sort (ranging from forgotten temples to laboratories of mad science), constructing facilities and spawning minions to terrorize the townsfolk and harass enemy players. In addition to base management, the game will feature turn-based tactical battles between rival factions. A handful of supernatural creatures are up for hire, including a number of classics like vampires, zombies, mummies, witches, and ghastly reapers - all of which can be enhanced through strategic upgrades. The game will feature a single-player mode, though if you tire of waging war against hapless villagers, you can challenge friends through online matches or "pass & play" games with one device. Finding opponents shouldn't prove difficult, though, as Haunted Hollow will be free-to-play (no word yet on how scary the microtransactions will be). Firaxis plans for a worldwide release sometime in spring 2013. Until then, you'll have to continue blending in with the unsuspecting townsfolk, keeping that pitchfork sharpened. 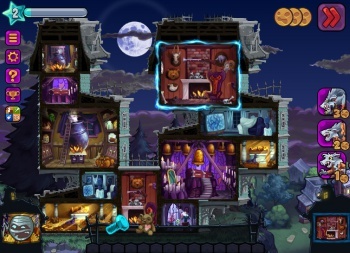 But when Haunted Hollow launches on the App Store for iOS devices, you'll finally show them. You'll show them all.